Is What We See Real? JJ van der Leeuw published "The Conquest of Illusion" in 1928, with a dedication to J. Krishnamurti and in memory of Krishnamurti's brother Nityananda. Richard Rose, who had a profound self-realization experience in 1947 at the age of 30, came across the book in the late 1950s, when it was recommended to him by a cab driver in Los Angeles who also told him about Alfred Pulyan. Rose recommended the book to his students, along with books by Hartmann, Santanelli, Ouspensky, Merrell-Wolff, Brunton and others. Among the valuable insights that van der Leeuw spelled out in the book, his second-chapter analysis of how we see stands out to me as one of the most provocative. He leads the reader step by step, in a simple yet complete fashion, to the inevitable mystery of sense perception  and to what can profitably be a "doubt sensation" about the relation of our perceptions to reality. He illustrates his analysis with a series of plates which I've included on this page along with some summary comments. In the first plate, van der Leeuw depicts the conventional understanding of an external world that we perceive accurately. In other words, our consciousness presents us with an exact replica of the outside world. He titles this a primitive idea of sense perception, so he obviously has an explanation in store that he considers less primitive. If we scrutinized the brain with our sense perception, or with equipment designed to enhance that capability, we would detect chemical and electrical changes  but nowhere would be find an image with color, shape, texture, etc. And that is the great mystery of sense perception. The image that we "see" depends on our interpretation of cellular changes. Van der Leeuw points out that, for all we know, what triggered the image may be "a mathematical point, having within itself certain properties which, reacting on a human consciousness, produce there the different qualities which make up the image ... as we see it." And there is another function in addition to interpretation that we're adding to the process: "We think we are perceiving as an objective reality that which we are projecting as an image in the world of our consciousness." Every image that we see in our consciousness we project outside ourselves and pretend that we're seeing that image outside. 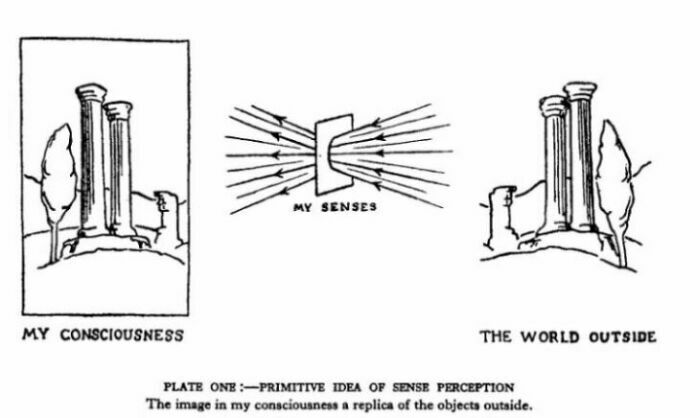 In plate three, The World of My Consciousness, van der Leeuw "complicates" the picture a bit by reminding us that we know the vibrations, the body, the eye, the optic nerve, and the brain by this same process of sense perception as we know a cat or a tree. And everything we know by sense perception is in the world that we're questioning  the world of the unknown. The relation of the image that we see to what actually triggers the perception (and projection) is unknown. The world we see around us is, in fact, an image arising in our consciousness. 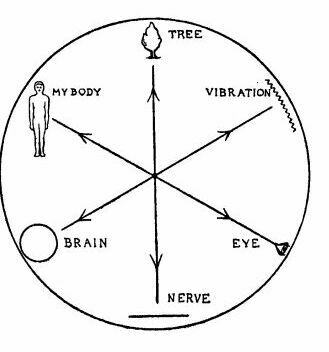 But if we compare notes with our fellow-beings, we find that there is a great similarity of interpretation between the tree we see and that our neighbors see. There must be a common source providing the stimulus that produces these compatible images in ourselves and our neighbors. Van der Leeuw terms this source the world of the real, and in the fourth plate he addresses the question of the relationship of the world of the real to the individual consciousness worlds. 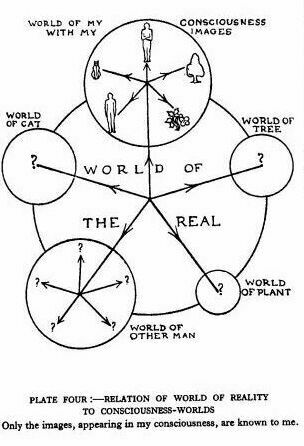 But where is this world of the real? 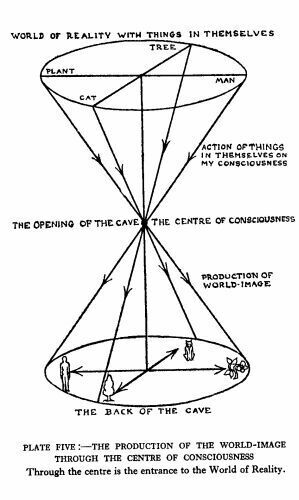 Using the allegory of the cave from Plato's Republic, van der Leeuw illustrates in plate five how the production of our world image is projected through an opening in the center of our consciousness. "Instead of being aware that they act on us from within," however, "we gaze upon the image ... and wonder how it influences us from without." The teaching of self-realized men throughout history has centered around their personal testimony that it's possible to follow the ray of projection back to its source, to the world of the real. And by transcending our identification with the world of individual consciousness, we find the solution to the problem of life. When we enter the world of the real, we return to our real home, simultaneously finding our true identity and the answer to all the questions of life and death. From On Having No Head: Zen and the Rediscovery of the Obvious © 2002 by Douglas E. Harding. The first half of this book was published in the 1960s and became a worldwide classic. At age 77 Harding had the final breakthrough and added "Bringing the Story Up to Date: The Eight Stages of the Headless Way." See the Greatest Teachers section of this site for more on Harding's life and teaching. Jonah Lehrer, a Columbia U. graduate and a Rhodes scholar, worked in the lab of Nobel Prize-winning neuroscientist Eric Kandel and in the kitchens of Le Cirque 2000 and Le Bernadin. His book is a fascinating study of eight artists including a painter (Cézanne), a poet, a chef, a composer, and several novelists  showing how "each one discovered an essential truth about the mind that science is only now rediscovering." In the case of Cézanne, it was about human vision. "Understanding how sight starts, how the eyeball transforms light into an electrical code, is one of the most satisfying discoveries of modern neuroscience. No other sense has been so dissected. We now know that vision begins with an atomic disturbance. Particles of light alter the delicate molecular structure of the receptors in the retina. This cellular shudder triggers a chain reaction that ends with a flash of voltage. The photon's energy has become information. "But that code of light, as Cézanne knew, is just the start of seeing. If sight were simply the retina's photoreceptors, then Cézanne's canvases would be nothing but masses of indistinct color. His Provençal landscapes would consist of meaningless alternations of olive and ocher, and his still lifes would be all paint and no fruit. Our world would be formless. Instead, in our evolved system, the eyeball's map of light is transformed again and again until, milliseconds later, the canvas's description enters our consciousness. Amid the swirl of color, we see the apple. 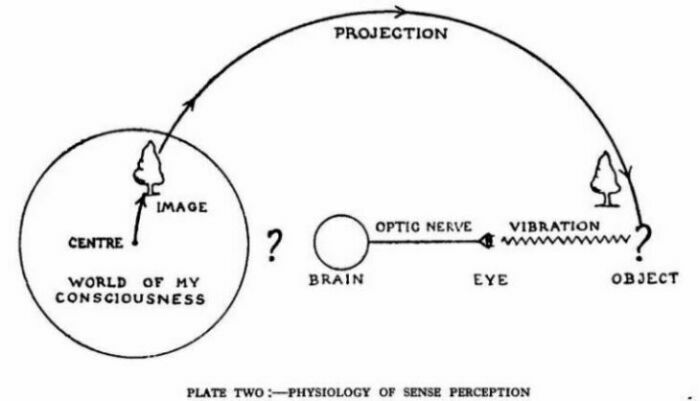 "Before Hubel and Weisel, scientists assumed that the eye was like a camera, and that the brain's visual field was composed of dots of light, neatly arranged in time and space. Just as a photograph was made up of a quilt of pixels, so must the eye create a two-dimensional representation of reflected light that it seamlessly transmitted to the brain. Yet when scientists tried finding this camera inside the skull, all they found was silence, the electrical stupor of uninterested cells. "This was a frustrating paradox. The animal clearly could see, and yet its cells, when isolated with a beam of light, were quiet. It was as if the animal's vision was emerging from a blank canvas. Hubel and Weisel bravely ventured into this mystery. At first, their results only confirmed the impossibility of activating cortical neurons with individual pricks of light. But then, by complete accident, they discovered an excited cell, a neuron interested in the slice of world it had seen. "What was this cell responding to? Hubel and Weisel had no idea. The neuron became active at the exact moment it was supposed to be silent, when they were in between experiments. There was no light to excite it. Only after retracing their exact steps did Hubel and Weisel figure out what had happened. As they had inserted a glass slide into the light projector, they had inadvertently cast "a faint but sharp shadow" onto the cat's retina. It was just a fleeting glint of brightness  a straight line pointed in a single direction  but it was exactly what the cell wanted. "Neuroscientists now know that what we end up seeing is highly influenced by something called top-down processing, a term that describes the way cortical brain layers project down and influence (corrupt, some might say) our actual sensations. After the inputs of the eye enter the brain, they are immediately sent along two separate pathways, one of which is fast and one of which is slow. The fast pathway quickly transmits a coarse and blurry picture to our prefrontal cortex, a brain region involved in conscious thought. Meanwhile, the slow pathway takes a meandering route through the visual cortex, which begins meticulously analyzing and refining the lines of light. The slow image arrives in the prefrontal cortex about fifty milliseconds after the fast image. 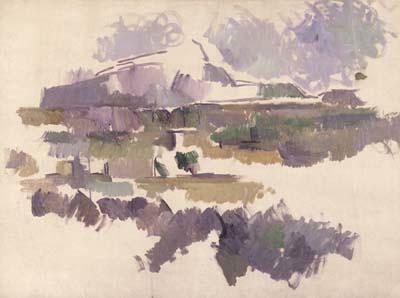 "As Cézanne aged, his paintings became filled by more and more naked canvas, what he eloquently called nonfinito. No one had ever done this before. The painting was clearly incomplete. How could it be art? 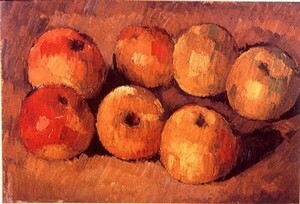 But Cézanne was unfazed by his critics. He knew that his paintings were only literally blank. Their incompleteness was really a metaphor for the process of sight. In these unfinished canvases, Cézanne was trying to figure out what the brain would finish for him. As a result, his ambiguities are exceedingly deliberate, his vagueness predicated on precision. If Cézanne wanted us to fill in his empty spaces, then he had to get his emptiness exactly right. "When Cézanne began his studies in the blank canvas, science had no way of explaining why the paintings appeared less vacant than they actually were. The very existence of Cézanne's nonfinito style, the fact that the brain could find meaning in nothing, seemed to disprove any theory of mind that reduced our vision to pixels of light. "... The Gestaltists set out to prove that the process of seeing alters the world we observe. Like Immanuel Kant, their philosophical precursor, they argued that much of what was thought of as being out there  in our sensations of the outside world  actually came from in here, from inside the mind. ("The imagination" Kant wrote, "is a necessary ingredient of perception itself.") As evidence for their theories of perception, the Gestaltists used optical illusions. These ranged from the illusion of apparent motion in a movie (the film is really a set of static photographs flipped twenty-four times a second) to drawings that seem to oscillate between two different forms (the classic example is the vase that can also be seen as two faces in silhouette). According to the Gestaltists, these everyday illusions were proof that everything we saw was an illusion. Form is dictated from the top down. Unlike the Wundtians [reductionists, who argued that visual perception is ultimately reducible to its elemental sensations - Ed. ], who began with our sensory fragments, the Gestaltists began with reality as we actually experienced it. "Modern neuroscientific studies of the visual cortex have confirmed the intuitions of Cézanne and the Gestaltists: visual experience transcends visual sensations.... If the mind didn't impose itself on the eye, then our vision would be full of voids. For example, because there are no light-sensitive cones where the optic nerve connects to the retina, we each have a literal blind spot in the center of the visual field. But we are blind to our own blind spot: our brain unfailingly registers a seamless world. "This ability to make sense of our incomplete senses is a result of human cortical anatomy. The visual cortex is divided into distinct areas, neatly numbered 1 through 5. If you trace the echoes of light from the V1, the neural area where information from the retina first appears as a collection of lines, to the V5 you can watch the visual scene acquire its unconscious creativity. Reality is continually refined, until the original sensation  that incomplete canvas  is swallowed by our subjectivity. "The shocking fact is that sight is like art. What we see is not real. It has been bent to fit our canvas, which is the brain. When we open our eyes, we enter into an illusory world, a scene broken apart by the retina and re-created by the cortex. Just as a painter interprets a picture, we interpret our sensations. But no matter how precise our neuronal maps become, they will never solve the question of what we actually see, for sight is a private phenomenon. The visual experience transcends the pixels of the retina and the fragmentary lines of the visual cortex." WHO IN THE BRAIN IS LOOKING? "... Nobel laureate Richard Axel's lab engineered a fruit fly with a glowing brain, each of its neurons like a little neon light. This was done through the careful insertion of a fluorescent protein in all of the insect's olfactory nerves. But the glow wasn't constant. Axel engineered the fly so that the fluorescent protein turned itself on only when calcium was present in high concentrations inside the cell (active neurons have more calcium). Using some fancy microscopy, Axel's lab group was able to watch-in real time-the patterns of activity within the fly brain whenever it experienced an odor. They could trace the ascent of the smell, how it began as a flicker in a receptor and within milliseconds inflated into a loom of excited cells within the tiny fly nervous system. Furthermore, when the fluorescent fly was exposed to different odors, different areas of its brain lit up. The scent of almonds activated a different electrical grid than the scent of a ripe banana. Axel had found the functional map of smell. Also see Peter Russell speaking on the mystery of consciousness, on the Favorite Video Clips page.